Someone on one of the facebook groups I'm on posted a video of an Aleut paddler paddling his kayak around in a circle. The video is a copy of a movie segment shot by a US Navy cinematographer in the early part of the 20th century. Mostly, the video is unremarkable. Unfortunately I can't share it. But several things about it are remarkable. 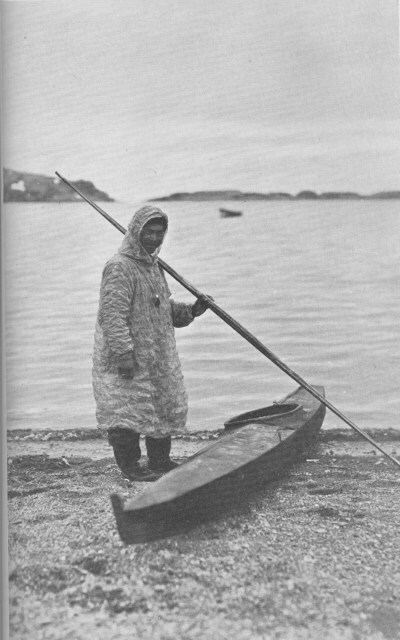 The first is that it may be the only movie footage of an Aleut paddling. The second is that it shows the paddler getting in and out of his boat. The third is that the paddle is quite long. This is a still photo, possible of the paddler in the video. What I found eye-opening about the video was the way that the paddler got in and out of his boat. Although Aleut kayaks seem to have had a more or less standard cockpit size of about 24 inches, a size that requires me to sit on the back deck of the kayak and carefully slide forward with my legs straight out before me and lower myself into the cockpit by the strength of my arms. What the video makes apparent is that whatever the size of the paddler and the size of the cockpit, the combination was such that the paddler could just step into the cockpit with one leg, sit down and then pull his other leg into the cockpit and extend it. The way he got into the kayak looked pretty much the same as someone getting into an open canoe or a modern recreational kayak with a long cockpit. Large cockpits have some disadvantages, mostly that they require large spray skirts that are harder to keep secure in rough water with waves breaking on the kayak than smaller skirts, but getting in and out of a kayak easily is a distinct advantage for launching and landing on a beach where waves are breaking. The other thing worth noting about the video was that the paddler both launched and landed with the kayak floating in the water, not resting on the beach. He was wearing long boots that allowed him to step into the water without getting his feet wet. He also seemed to have quite good balance and agility so that he could step into and out of his kayak without a doing a lot of bracing with his paddle the way I have to do. Can I ask which Facebook group? I'm always a little suspicious of the die-hard replica crowd: we know that the original boats were custom fitted to a particular paddler, who was almost certainly shorter, stockier, and in the case of the Aleuts more skilled, than any of us. So a replica isn't actually providing a "replica" paddling experience, is it? good points, Chris. on the one hand, if you want to build a replica and call it a baidarka or whatever, there's only so far you can go with your mods and still call it that, but on the other hand, once you've figured out what a replica is good at, invariably, you may want to make changes for the environment that you are in. re the facebook group, iQya-x Mike Livingston, moderator.